Last week saw the first in hopefully many more Melbourne Urban Design Meetups (MUDM). The focus of the night was a presentation by City of Melbourne's Yvonne Lynch who leads the Urban Ecology and Urban Forest Team at the City of Melbourne. The team focus is ecosystem led adaptation for climate resilience and citizen engagement through transparency and participation. She has developed and led some of the most progressive climate change policies and initiatives for the city including the implementation of the Climate Change Adaptation Strategy, the strategic development of the 1200 Buildings Program, securing a legislative amendment to initiate Australia’s first Environmental Upgrade Agreement, developing the Urban Forest Strategy and the Tree Protection Policy. She has commissioned Melbourne’s first research on sea-level rise, white roofs, dendrochronology to assess the effects of climate impacts. These projects have received awards nationally from the United Nations Association of Australia, The Banksia Foundation and the National Climate Change Adaptation Research Centre and internationally from the C40 Cities Program. Organised by Charlie Woolford, Melbourne Urban Design Meetup is an opportunity for like-minded individuals interested in urban design, city design, sustainability an the built environment. There will be a series of regular meetups where individuals can come along and meet professionals from within the industry, enthusiasts and people with a general interest towards urban design. The next MUDM event will feature a brief presentation from Charlie Woolford that explains what MUDM is, its aspirations, what people can expect and how they can get involved. Melbourne’s tree population is vast – we have 70,000 council-owned trees, worth around $650 million. Trees are a defining part of Melbourne. We live in the world’s most liveable city and our parks, gardens, green spaces and tree-lined streets contribute enormously to this status. But the trees are now under threat. More than a decade of drought, severe water restrictions and periods of extreme heat, combined with an ageing tree stock, have put our trees under immense stress and many are now in a state of accelerated decline. As a result, we expect to lose 27 per cent of our current tree population in the next decade and 44 per cent in the next 20 years. Combined with this loss, Melbourne’s urban forest is facing two significant future challenges: climate change and urban growth. 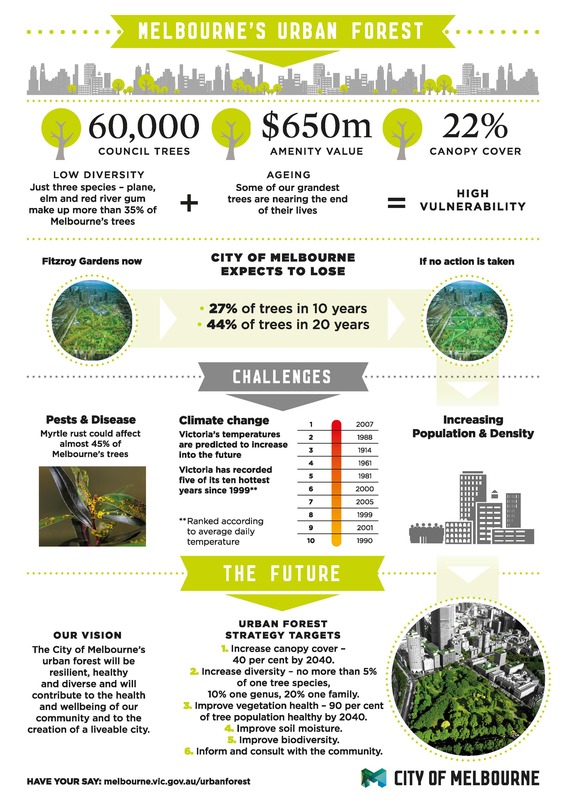 The City of Melbourne’s Urban Forest Strategy seeks to manage this change and protect against future vulnerability by providing a robust strategic framework for the evolution and longevity of Melbourne's urban forest. A great online resource tool that the City of Melbourne have developed is Urban Forest Visual which features a map that allows users to track the Useful Life Expectancy (ULE) of each tree within the municipality while providing info on the specific species of tree as well as other useful facts and figures. You can even send the trees personalised emails, for those so inclined. "A city within a forest, not a forest within a city"
To stay up to date or connect with MUDM, you can follow them on Twitter or on their Meetup page. 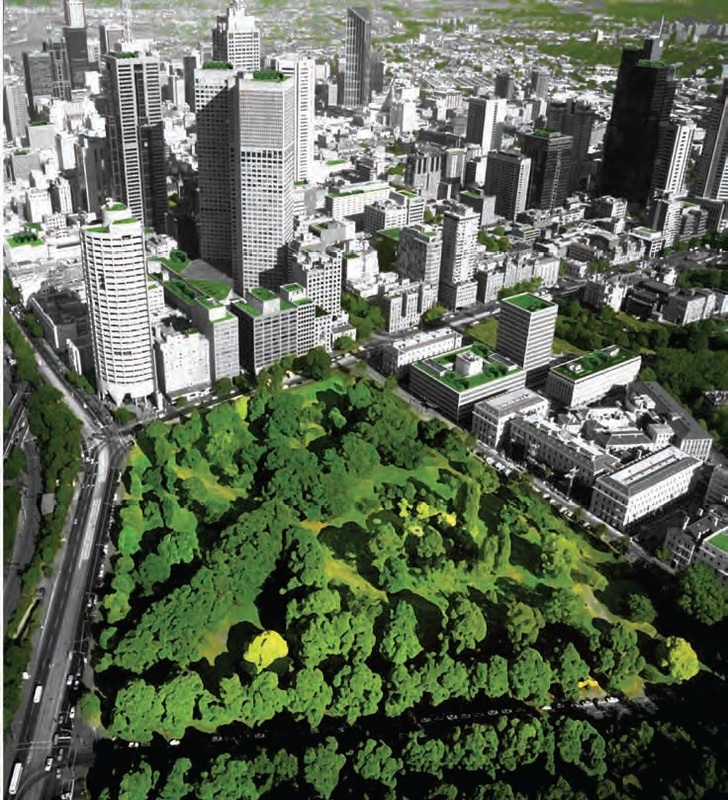 City of Melbourne's Urban Forest Strategy is available from their website. Hope to see you at future MUDM events.